Green is in--and not only with respect to alternative energy, the environment, renewal of resources, but also with food! Proven fact: green, leafy veggies are good for you, but do you get enough? I know that I don't and that's why I find ways to incorporate them into my diet--hence, the creation of this Green Pizza. Using pesto instead of traditional marinara sauce as a base, my Green Pizza topped with grilled chicken and smoked mozzarella made for a delicious and healthy pizza alternative. Toppings can be substituted with virtually anything that you like. I think that an interesting variation to basil pesto might be arugula leafs or even arugula pesto. Roll out dough into a round shape and sprinkle with cornmeal, so that it doesn't stick to the surface. Don't worry if it isn't perfectly round--I think it looks better when it's rustic. 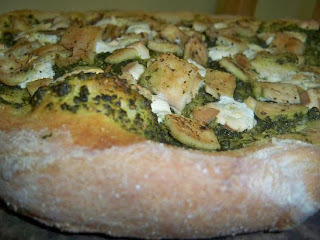 Spread thin layer of homemade pesto on top, leaving a 1 inch border for crust. Top with grilled chicken cubes and smoked mozzarella. Bake in oven for 25-30 minutes or until crust is golden.